We went to Holland…..in April. So I’ve had six months to think about this post in my drafts folder, and the fact that I’m falling further and further behind in documenting our travels. One of the best things about living in the middle of Europe is the opportunity to see so much. But it turns out our capacity to absorb awesome places and incredible historical sites and unique meals and interesting culture is limited. Very quickly, you can end up feeling stuffed. By writing about our experiences, we hope to better remember and savor them. 1. Where is Holland anyway? North and South Holland are two provinces in The Netherlands. This clever video explains it well. Seriously, check out that link- it’s quite interesting. We stayed in Edam, a little city in the Northwest corner of The Netherlands in North Holland. While we didn’t make it into Amsterdam on this trip, the area where we stayed was so quiet and lovely. 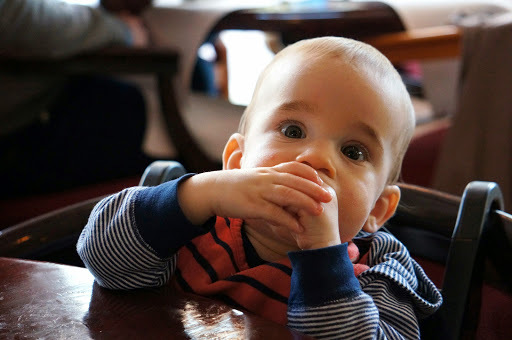 We woke up each morning to cows and sheep and brand new lambs out our bedroom window, a home cooked breakfast, and helpful advice from our homeaway hosts on what to see and do. Side note- we’ve had nothing but wonderful experiences staying in peoples’ homes or guest houses through sites like airbnb and homeaway. We read reviews thoroughly and do our research because it’s worth it to us for more of a personal home base from which to see a new place (also, it’s often much cheaper, especially when you have a kitchen to work with). Hotels can look the same all over the world, but the hospitality of locals can make for a truly unique, memorable experience. 2. Hyacinths, tulips, daffodils and a million other flowers I didn’t know existed. Today, the Netherlands is still the world’s main producer of commercially sold tulips, producing as many as 3 billion bulbs annually, mostly for export. 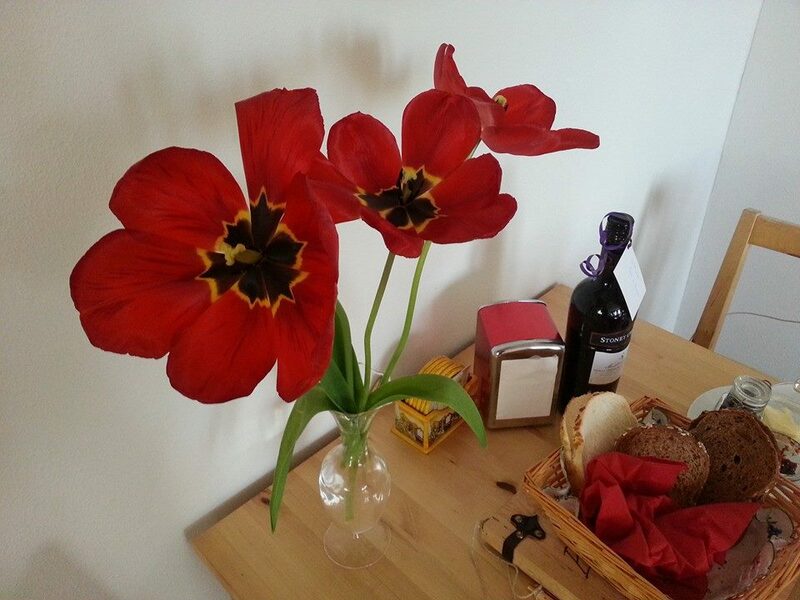 We learned that tulips are actually originally from Turkey, brought to Holland in the 16th century. Also, it takes a full five years for a tulip bulb to form from seed! While the gardens at Keukenhof are beautiful, we were much more impressed by the endless fields of flowers. On a smaller scale, you can see beautiful floral arrangements just about anywhere, but the fields are quintessentially Holland. 3. We really, really don’t like crowds. Or selfie sticks. Unknowingly, we went to the famous Keukenhof gardens on their biggest weekend of the year, the day of the flower parade. Maybe for other people this would be a happy mistake, and maybe we just need to be a bit more patient, but shuffling through thousands of people, pressed on all sides, battling to get a view of the gardens unobstructed by selfie sticks just isn’t our thing. The amazingly sweet smell of the flowers mixed with cigarette smoke is disappointing. Forty minute waits to use the bathroom are problematic. That said, the gardens would be so, so lovely on a less insanely busy day and we’d love to go and enjoy them again with better planning! 4. The Dutch are serious about their cheese. We enjoyed some of the very famous (and in our case, very local) Edam cheese each morning with our breakfast. In retrospect, we should’ve bought a lot more cheese. It was so, so good. The Dutch produce 650 million kilos of cheese annually, exporting 2/3 of that, which makes Holland the largest cheese exporter in the world. I read that the average person in The Netherlands eats about 7 lbs of cheese per year, but given how much we consumed in a weekend, that figure almost seems low. We ordered a cheese plate with our dinner one evening which, apart from the exceptionally stinky, very blue cheeses, we enjoyed. Daniel’s palette is a little less limited, I guess, because he devoured those we couldn’t stomach. 5. The Dutch are also serious about biking. Everyone bikes, everywhere. We saw several bikers with a child in a front seat, a child in a rear seat, a trailer with an additional kid or two, and sometimes another child riding alongside. So impressive. We might’ve seen all of these awesome family bikes over the course of our two day trip. It’s been said that “God made the earth, but the Dutch made Holland”. The Dutch first began battling the sea about 800 years ago and today, over 1, 491 miles of dikes keep North Sea from flooding, oh, 65% of the country below sea level. The amount of infrastructure required to keep this country in existence is really quite incredible- bridges, dikes, dams, canals. We noticed these shells in a parking lot- proof that this used to be the ocean floor. All the water allows for amazing bird life – swans nesting, ducklings swimming, cranes and pheasants and geese and probably hundreds of other birds I couldn’t identify. 7. How windmills actually work. They’re big. And impressive. They have sails. They can rotate 360 degrees. Who knew? It makes sense that The Netherlands- totally flat and very windy- has so many, many (1000+) windmills. They were (and are, in a few places) used to mill, saw, pump and press–everything from bread and mustard to oil, paint and paper. Today, the working windmills are primarily used for drainage to keep all the reclaimed land from flooding again. 8. Wooden clogs are a real thing. As in, we didn’t realize before that people really wore these shoes in real life for hundreds of years. Historically, there were many varieties and styles for different classes, vocations and occasions. These below are traditional wedding clogs. 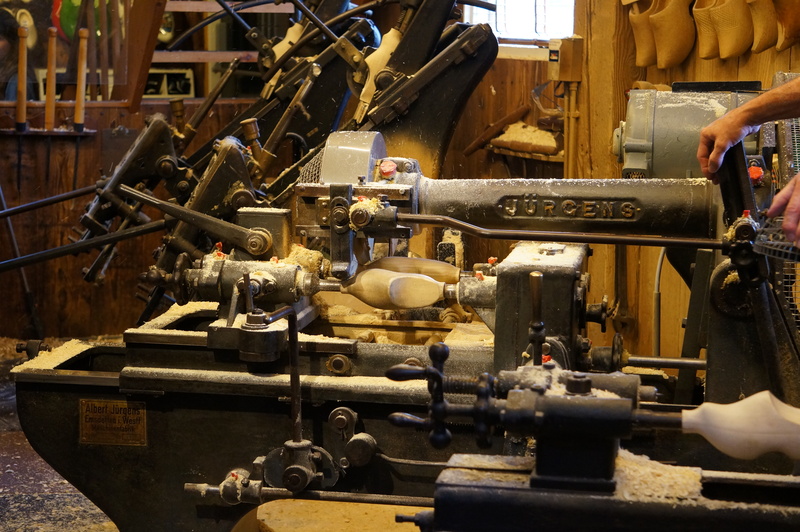 Today wooden clogs are really only worn by some rural farm workers and tourists, but in a number of places, you can still watch them being made, carved from a single piece of wood. We watched a demonstration on the craft, fought our way through hoards of people buying these not terribly comfortable shoes, and purchased a tiny key chain clog for our token Christmas ornament from The Netherlands. We decided that a single Christmas ornament from each country we visit will be our “thing”- no souvenirs to collect dust around the house, no worries about where to put stuff all year long. 9. Chocolate sprinkles are a legitimate breakfast food. Our hosts brought us a bottle of chocolate sprinkles with our breakfast each morning, alongside an assortment of delicious breads, cheeses, jams, butter, coffee, tea, smoked meats and eggs. Each morning, we ate everything else and puzzled over the purpose of the sprinkles. 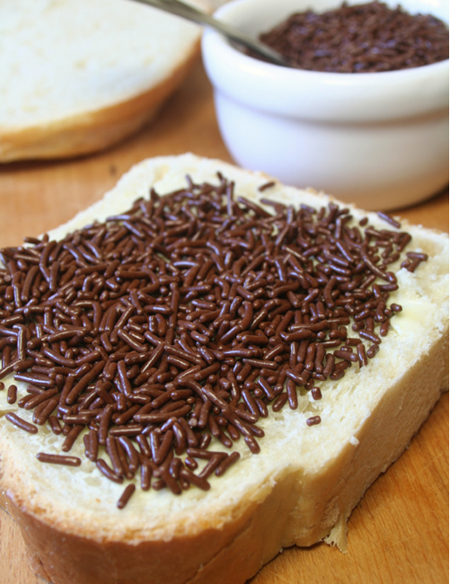 I didn’t realize until much later that the “hagelslad” (the Dutch word for sprinkles, meaning “hailstorm”) are eaten on buttered bread for breakfast. Or a snack. Or lunch. Or whenever you, respectable grown- up, want to eat chocolate sprinkles for a meal. 10. The little dutch boy is an American fable. It’s a classic children’s story we grew up with- a little boy sticks his finger in a hole in the dike and saves his village from flooding. It seems the only thing we really knew about Holland before our trip turned out to be a story imported by American tourists. The tale originates from American author Mary Mapes Dodge, who published the story in her book “Hans Brinker” or “The Silver Skates” in 1865. We’re a little disappointed. Daniel, on the other hand, is angry about the car. 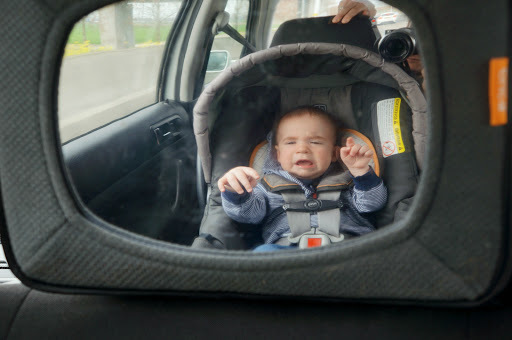 Teething, tired, screaming for the entire four hour drive there and back again, this was not Daniel’s best trip. Real life traveling with a baby, folks. After this weekend, frazzled and exhausted, we wondered if our road tripping days were over for a while. But thankfully, Daniel is quite a good traveler and this particular weekend proved to be the exception, not the rule. Thanks, kid- we still have a lot to see! In fact, we’d love to make it back to The Netherlands again, perhaps with a visit to Amsterdam, a canal tour, the Anne Frank house, and the sea. I grew up eating Hagelslag! And lots of cheese! So glad you got to experience some of the culture and beauty of The Netherlands. Keukenhof is beautiful and worth a return trip when it’s not so crowded. I still have the Dutch bike I rode as a kid…it’s about 57 years old and waiting for me in Wisconsin. On your next trip, be sure to try Pannekoeken and Poffertjes.